For anyone out there who are missing one or more of their teeth, nothing really beats titanium-based dental implants for looks, durability, and convenience. Dental implants function as good or better than your regular teeth and don’t have to be removed daily and cleaned in the same way as dentures. For the right candidate—who’s in good overall health with a healthy immune system and whose gums are healthy enough for dental implants—dental implants can be the best decision that you ever made. 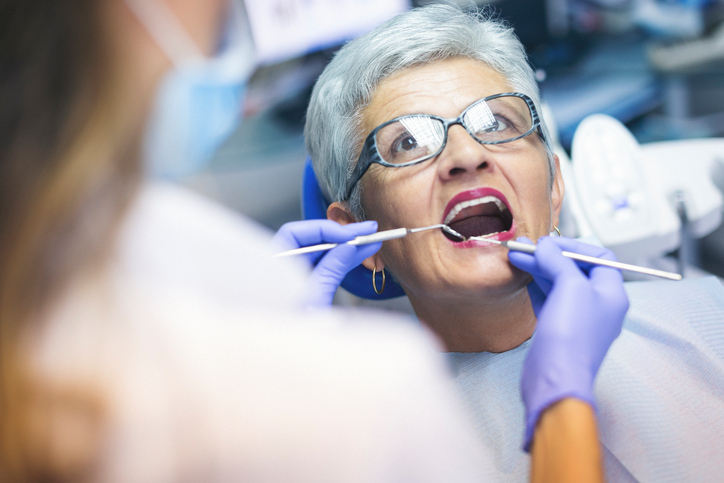 Some patients, though, really want dental implants but their jaw bones aren’t hard or thick enough to support dental implants for years to come. It’s important that your jaw bone be able to support dental implants and, fortunately, a bone grafting procedure could help patients do just that. So, what exactly is a bone graft procedure and why is it studied and used in practice by implant dentists and oral surgeons? In the broader medical world, bone grafts are used for a variety of issues. Typically, bone grafts are used by surgeons to treat problems with bones or joints that have undergone some kind of trauma. Bone grafting in general simply means that you’re transplanting bone tissue from one area of your body to another. In the case of dental implants, the idea is to use a small section of your own bone or a durable synthetic material (very common, these days) to implant into your jaw bone in order to strengthen it. At Central Florida Periodontics and Implantology, dental implants usually follow a three-phase process: Consultation to determine your eligibility, placing the implants into the patient’s jawbone, and a few months later a healing collar and the patient’s new teeth can be attached to the implants. The one imponderable is how long the patient’s jawbone takes to recover from phase two—this could take anywhere from, in most cases, three to six months. Fortifying the jawbone and getting it healthy enough for a shorter turnaround is what bone grafting is all about. Strengthening the jaw bone for dental implants might mean bone grafting. Minor bone grafting can sometimes be done on the same occasion as your implant procedure, but that depends on how strong the patient’s jaw bone is initially. Patients who need more extensive bone grafting might need to wait three months or more for jawbone to sufficiently strengthen and be able to support dental implants. It takes time for both the new bone to grow where it has been transplanted and, once your implants are installed, for osseointegration to take place between the supporting posts and your own jawbone. The dental implants that Dr. Sevor predominately uses in this context are known as endosteal implants that go directly into your jawbone for more stability. Bone grafting works to strengthen the jawbone so that the metal cylinders that are eventually inserted into the jawbone will be strong enough to support the abutment piece that will hold your implant in place. In the same way that your home needs a strong foundation, you need a strong jawbone to support endosteal implants. Bone grafting is one way to fortify that area and make permanent dental implants a real possibility for patients whose jawbones would otherwise be too slender or soft to support implants. The end goal of a bone graft procedure is to create a strong enough jawbone to support dental implants. To find out if you’re a candidate, contact Dr. Sevor’s friendly staff today!